Shiva hours: from 2:00 p.m. to 4:00 p.m. and 7:00 p.m. to 9:00 p.m. Evening services at 7:15 p.m. Due to the advent of Passover, shiva ends Thursday evening. Jewish General Hospital Auxiliary (514) 340-8216. Dear Judy and Phil We extend our sincere condolences on the passing of your mother. Our thoughts are with you at this very sad time. Dear Judy and family. Please accept my sincere condolence on the passing of your dear mother. May your many cherished memories of her help you through this difficult time. Dear Michael, Mindy and the Sperber Family, Our heartfelt condolences on your loss. May the happy memories you shared help you through this difficult time. Dear Judy,Phil & Family: Linda joins me in sending you our condolences on the loss of your beloved matriarch. May your fond memories sustain you at this difficult time. Dear Judy, Phil and family, Our condolences on the passing of your beloved mother and mother -in- law. May the cherished memories help during this difficult time. Dear Judy, Phil and families. Our deepest sympathies to you on the passing of your mother (mother in law). May you know of no further sorrows. Sharon and family, so sorry for your loss. Wishing you strength at this difficult time. Dear Judy, Phil and family - our deepest sympathy on your loss. Our thoughts are with you at this difficult time. Dear Judy, Phil & family - Our sincere condolences on the loss of your mother & mother-in-law. May your wonderful memories help you through this difficult time. Dear Judy, Phil, Steven and family, Our deepest condolences to all of you on your loss. We are thinking of you during this difficult time. Dear Judy and Phil, my sincerest condolences on the passing of your mother and mother-in-law. May the wonderful memories live in your heart and give you comfort during this sad time. Dear Judy and Phil, Our sincere sympathy on your loss. May your fond memories comfort you at this difficult time. Dear Judy, Phil, Mindy and Michael, My sympathy to all your family on the loss of your mother and mother-in-law. May wonderful memories of her help you through this sad time. Dear Michael, Mindy and Family, We extend our most heartful sympathy to you and your family on the loss of your beloved mother and mother-in-law. May the wonderful memories you have provide you all some solace. Dear Michael, Our thoughts and prayers are with you at this sad time. May your beloved mother always be a blessing. Dear Judy and Phil & Families, We are sorry to hear of the passing of your Mother,Mother-in-law,Grandmother & Great- Grandmother. We hope that the love of family and friends will strengthen you in the days ahead. Memories are portable - they go anywhere anytime. Our deepest sympathy on the loss of your beloved mother. Dear Michael Mindy and family, Please accept our sincere condolences on the passing of your dear Mom Esther. May her memory be a blessing to you. Dear Michael Mindy & Family Our sincere condolences on the sad loss of your mother.May the love & support of family & friends help you through this difficult time. Dear Michael and Family, Sincere condolences on your loss. May G-d comfort you among the mourners of Zion and Jerusalem. Dear Judy and Phil, Please accept my heartfelt condoléances on the passing of your mother. Mindy, I am sorry for your loss. Dear Judy, Phil and Family our heartfelt condolences on the passing of your mother. May she Rest In Peace. Dear Judy, Phil and family. My sincere condolences on the passing of your mother. May your fond memories be a comfort to you all. Dear Judy, Phil and family Please accept our sincere condolences on the loss of your Mother and Mother-In -Law. I'm very sorry and sad about grandma and I was really lucky to have such an amazing relationship with her. Dear Judy and Phil..our condolences to you and your family on the loss of your mother. May your fond memories help bring you some comfort at this sad time. To Judy,Phil and the entire Sperber family. Our most sincere condolenc on your loss. May wonderful memories carry you through this trying time. Dear Judy.Phil,Michael,Mindy and Family,Our deepest condolences on the passing of your beloved Mother and Mother-In-Law. May the special memories you shared together as a family be a comfort to you. Dear Michael, Mindy and family, our deepest condolences on the loss of your beloved mother. May your memories of her bring you comfort at this sad and difficult time. Love from the Grossner family. Dear Phil, My sincere condolences to you & family on the loss of your mother-in-law. May she rest in peace. Dear Mindy, Michael and family, I was so sorry to hear of your mother’s passing. My sincere condolences to all of you. Dear Judy and family, Our deepest condolences on the loss of your mom. You truly were an outstanding daughter and may all your wonderful memories sustain you. Our thoughts are with you on this very sad day. Dear Judy , Phil and family, A mother is a precious gift, never to be replaced, cherished and cared for. When the gift is lost we can only remember its beauty and caring. The circle of life, the story of love. May all the memories fill your hearts at this moment in time and remain with you forever. 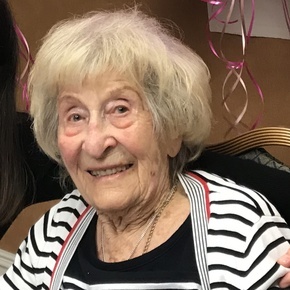 To the family of Esther Sperber....While the passing of a loved one requires us to mourn, in the case of your mother, mother-law and grandmother, it is also a time to celebrate a fine woman who lived a full life, right up to the end. May your memories of her be for a blessing and May the Lord comfort you among the mourners of Zion and Jerusalem and may you know no further sorrow. Dear Michael, Mindy, Judy, Phil and families. Harold and I extend our deepest sympathies to all of you. We are thinking of you during this difficult time. Dear Judy and Michael...Please accept my very deepest condolences on the passing of your beloved mother. Esther was a dear friend of my mom, Sylvia Davidson. They both hailed from the UK. I remember, with delight, seeing Esther at the West End Gym in the Cote St Luc shopping centre many years ago. She looked wonderful and put many of the much younger crowd to shame with her energy and vitality. Such a sweet lady. May she rest in eternal peace. Dear Judy and family, my sincere condolences on the passing of your mother. You were all blessed to have her in your life for so many years. Dear Judy, Phil and family, Our heartfelt condolences on the passing of your mother Esther. It was always nice to see you all together at synagogue. Judy you were truly a devoted daughter. May wonderful memories sustain you at this difficult time. Dear Mindy, Michael and Family, Our most sincere condolences to you on the loss of your Mom. May the love and support of family and friends bring comfort to you at this sad time. Dear Judy, Phil, Michael, Mindy and all who loved your mother. Words do not come to mind that might give you any comfort on the passing of your mother. The loss of a mother, no matter her age, is always difficult. She is irreplaceable. May you find solace in your memories of a life well lived. Please know that our thoughts are with you and we wish you no more sorrow. Please accept and extend to your entire family our most sincere condolences. Linda and Irwin. Dear Judy, Phil, Michael, Mindy and Family, How lucky you all were to have Tess in your lives! She was a most loving and caring person with a wonderful sense of humour. May all the wonderful, happy and special memories of time together comfort you as you mourn the loss of a much loved and respected mother, mother- in-law, grandmother and great grandmother. When that special someone becomes a memory, that memory becomes a treasure....let us all treasure those beautiful memories of Tess. Dear Judy and family - Sincerest condolences to all. May your wonderful memories help you through this difficult time. Peacefully, on Sunday, April 14, 2019, in her ninety-ninth year. Beloved wife of the late Edmund. Devoted and loving mother and mother-in-law of Judy and Phil Singer, Michael and Mindy Sperber. Adoring grandma of Lianne Singer and Shawn Austin, Sharon Singer and Teddy Smith, Steven Singer and Lianne Lewis; Sarah McMahon-Sperber. Proud great-grandmother of Jeremy, Evan, Dylan, Nicole, Jordan, and Tori. Predeceased by her three sisters and six brothers. Treasured aunt to her many nieces, nephews and their families. Esther will be dearly missed by all who knew and loved her. Funeral service from Paperman & Sons, 3888 Jean-Talon St. W., on Tuesday, April 16 at 11:00 a.m. Burial at Hebrew Sick Benefit Association Cemetery, de la Savane. Shiva at her daughter’s home from 2:00 p.m. to 4:00 p.m. and 7:00 p.m. to 9:00 p.m. Evening services at 7:15 p.m. Due to the advent of Passover, shiva ends Thursday evening. Contributions in Esther’s memory may be made to the Jewish General Hospital Auxiliary (514) 340-8216.